I was thinking about writing a post about our decision to cut our monthly bills by over $50 a month by getting rid of our cable television subscription. 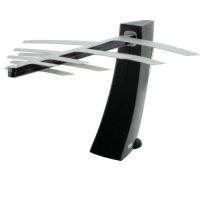 But Zack over at the SnapStream Blog beat me to it with a top 10 things he loves about his over the air HDTV antenna post. Rather than echo everything he wrote, I’ll tell you a little story. When Farrah and I lived in New Jersey, our internet service was provided by Princeton University. We paid for it, but not very much. Since we knew our broadband bill was going to rise after we moved to New York, I suggested we get an HDTV antenna and eliminate our cable service. Considering I was the one who had convinced her that we should get cable a few years ago, it wasn’t really that hard a sell. We don’t actually have an HDTV, but I figured (correctly) that the HDTV antenna would capture high quality video which we could use BeyondTV to compress as DiVX videos that would look far better than the videos we’d been recording from analog cable. The only real problem I’ve had is that I’m using an indoor antenna, and it took a few weeks to find exactly the right position to pick up the highest number of stations. When the antenna is not positioned just right, you can wind up with glitches. If you’re watching live, you get up and walk over to the antenna and adjust it. But if you’re recording programs to watch later, this can be a big problem. Sometimes you get glitches only once every few minutes, making it hard to detect a problem when you’re standing by the antenna trying to figure out if it’s in the right position. And even though the NBC and CBS affiliates should be coming from the same tower, it’s hard to arrange the antenna to pick them both up. I think we’ve finally got it. But for some reason PBS doesn’t come in. *shrugs*. There are a few shows I miss. I recorded the first half of this season’s Stargate SG-1 episodes before we moved, and so I might download the rest from iTunes. But for the most part, we can find plenty of programming on broadcast TV. And we can supplement that with internet video. I’ve put Joost on the media center PC in the living room, and we watch The Daily Show using the Comedy Central Motherload plugin for Windows Media Center. It’s not a perfect system (too many button clicks), but it’s free. And we can use BeyondTV and the slight inconvenience associated with online video to make sure we’re not vegging our lives away in front of the TV, but rather watching shows we really want to see. I often fantasize about killing cable. When I lived alone, I would do just that half the year when college football wasn’t on. I think it’s probably easier to do it these days since so much television content from cable networks (USA, HBO, etc) can be Netflixed 6 months to a year after the fact. And so much of it is available for free online from network websites these days too. I’ve been playing with VeohTV for the last few days, and while it doesn’t play as nicely with my Firefly remote control as I’d like, it’s a nice full-screen interface for accessing selected full-length Fox, NBC, CBS, and CW TV episodes directly from the network websites. An indoor antenna is ok only if you live in a big city or near the towers site. In my location, indoor antenna is worthless. I am looking into buying an outdoor cm4228, it has the best reviews there, but I am a bit reluctant because of the installation hassle. This antenna is quite large and heavy. I often fantasize about killing cable. When I lived alone, I would do just that half the year when college football wasn't on. I think it's probably easier to do it these days since so much television content from cable networks (USA, HBO, etc) can be Netflixed 6 months to a year after the fact.